This kit comes with supplies to make felt animals and notebook covers. It's loaded with lots of little goodies... scissors, thimble, measuring tape, buttons, ric rac. And it comes in a cute little case, too! Great gift idea for an older child. Recommended for ages 7 and up. This adorable free printable comes in three shapes: flower, sun, and lion. This is a great activity for younger children. Give them a blunt needle and some yarn and let them go to town. You could also use a shoelace... the plastic on the very end takes the place of the needle. This is such an awesome idea, and I plan on putting this together for my girls. The "sewing" in this basket is an embroidery hoop with a non-slip drawer liner stretched in it... brilliant! The printable Mini-eco sewing cards would make a great addition to this kit. I think there might be a little sewing basket showing up under our Christmas tree this year. I have no doubt that it will provide hours of entertainment. 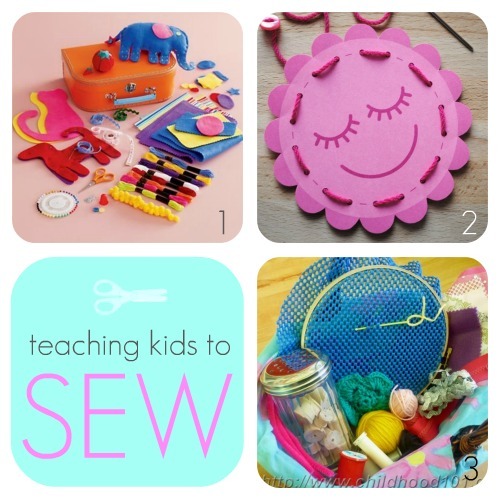 Have you taught your daughter, son, or grandchildren to sew? Any tips? Great pin inspiration. 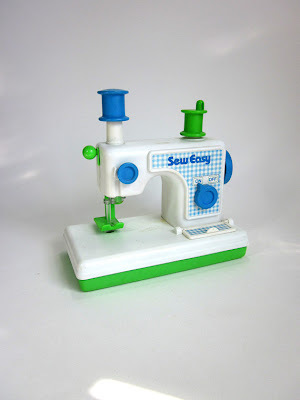 I recently found a Sew Easy at Value Village! I love the sewing basket, fruit mesh and lacing cards are great first starts. My daughter has the beginner's sewing kit and she has made quite a few things in it already. Thanks for the pins. I may print out the sewing cards for my Goddaughter. Great idea and one that will have a lasting touch on any child. I loved those lacing cards. When my granddaughter was younger I searched high and low for the cards....I should have just made them myself! Thanks for sharing. When I was very young I can remember having a set of picture cards with holes predrilled in them which were accompanied by wool with plastic ends..like laces. I loved doing them..not perfectly mind you! They were like the second pic but bigger and multicoloured. The beginner's sewing kit is a great idea. I know I would have loved one of these when I was little. 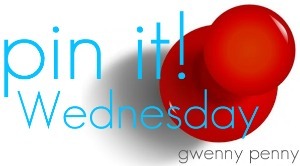 A lovely round-up Gwen!